Granton® is a trademark of the Granton knife company of Sheffield, England. But many knife companies tend to use the term Granton to describe a particular knife blade edge. A Granton blade has a row of identical dimples (or scallops) on both sides of the blade. 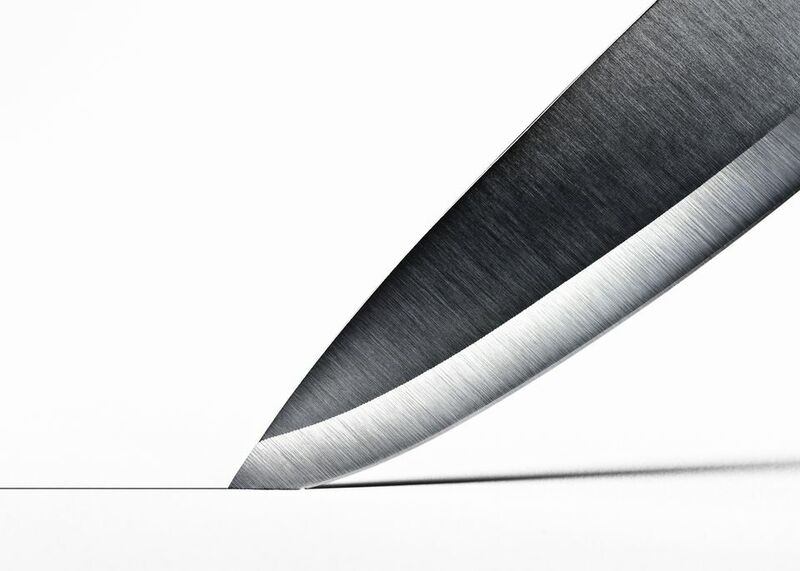 Unlike a serrated edge, which is scalloped along the edge itself, a Granton blade is scalloped only along the sides and has a straight edge, much like a standard knife. A Graton blade also can be honed with knife steel or sharpened just like a regular knife. A Granton edge enhances a knife's cutting and slicing performance by creating tiny air pockets between the food and the blade. This creates better food "release" and prevents food from shredding and tearing to keep the food as intact as possible. A Granton blade is particularly helpful when cutting to moist or clingy food, such as salmon, cheese, cucumbers, and many meats. Granton knives also look beautiful, adding to their appeal for home cooks. Granton blades were found primarily on Santoku knives when they became popular with home cooks, but now this blade type is widely available on many types of knifes, including chefs knives, carving knives, and paring knives. Knife manufacturers continue to look for ways to build on the smart Granton edge design by applying it to different knife types and varying the angle of the dimples. However, a true Granton Edge is still a great knife blade feature to look for, in comparison to other brands. A true Granton Edge blade and is made from high-carbon stainless steel and has scallops that are ground by hand. A key feature of a true Granton Edge is that the scallops are alternating on opposite sides of the knife. This gives the edge more strength because each hollow area is backed by a solid (non-scalloped) area on the opposing side of the blade. Many knives with a Granton type edge do not alternate the scallops. Choosing the right knife comes down to its purpose. When it comes to food preparation and cooking, you want to look for the best cutlery for your buck. An all-purpose chef's knife is best in steel and can come in German and Japanese styles. While harder steels hold sharper edges for longer, they can also be difficult to sharpen when they get dull. You also want to consider the knife feels in your hand. Think about what you need your knife to do the most, from dicing an onion and slicing herbs to cutting vegetables and chopping up meat. A good-quality set will include knives that are nimble, sharp, sturdy, and comfortable. One of the most important features of a knife is the ability to sharpen it because any type will become dull one day. Well-rounded knives should be able to cut tough food, be easily sharpened, and make you feel secure when using it.